Emma Hull is excited to announce an exclusive performance of the Dramatic Exploits of Edmund Kean in the period Drawing Room at Squerryes Court, shortly before the production heads to Washington and London. The production charts the rise and decline of one of the most unique talents that British theatre has ever produced. Following years of hardship as a strolling player, Kean was catapulted to stardom following his performance as Shylock at Drury Lane in 1814. Quickly becoming the most popular actor of his day, Kean electrified his audiences with his performances in Shakespeare. Yet within a few short years Kean’s increasingly erratic behaviour, fuelled by drink, ensured audiences remembered Kean for all the wrong reasons. 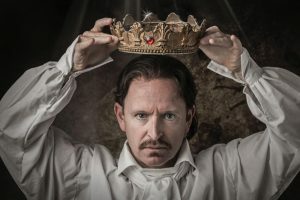 It will be performed as a monologue by Royal Shakespeare Company’s accomplished actor Ian Hughes, winner of the first Royal National Theatre Award for Best Actor. Tickets are available for the performance only, with a pay Squerryes bar during the interval, or for the performance including a delicious meal served during the interval in our Great Hall prepared by our Court chefs.